Calgary Flames Recent Slide: Trend or Just a Red Flag? Flames Recent Slide: Trend or Just a Red Flag? The Christmas break couldn’t come at a better time for the Calgary Flames. The team leads the Pacific Division with 47 points. They have lost three straight games, though. It’s their second three-game losing skid of the season. Saturday’s 3-1 defeat to the St. Louis Blues might serve as a wake up call for a common topic in recent memory: lack of secondary scoring. Correct. This sentence was heard many times during the 2017-18 campaign. The Flames missed the playoffs, prompting several changes in the offseason, such as the trade that brought Elias Lindholm to Calgary and the free agent acquisition of James Neal. This season, Lindholm has undoubtedly thrived on the top line alongside Sean Monahan and Johnny Gaudreau. Neal, on the other hand, has been a disappointment so far. Thirty-seven games into the season, the veteran winger has only seven points (three goals and four assists). However, the lack of scoring from the bottom six hasn’t become a major trend yet since the Flames are enjoying a great run to this point, but a quick peek into their last four regulation losses may raise some eyebrows. Calgary’s last four losses in regulation include a 2-0 to the Vegas Golden Knights on Nov. 23, a 1-0 loss to the Edmonton Oilers on Dec. 9, a 2-0 loss to the Dallas Stars on Dec. 18 and 3-1 to St. Louis on Dec. 22. Shutouts aside, the team’s top line combined for only two points. Gaudreau and Lindholm had an assist each. Their other dangerous forward, Matthew Tkachuk, scored the goal. And, in many ways, the losses to Dallas and St. Louis were similar. In the St. Louis game, the Flames made a push in the second period that did not result in goals. In addition, the team looked flat for most of the game. 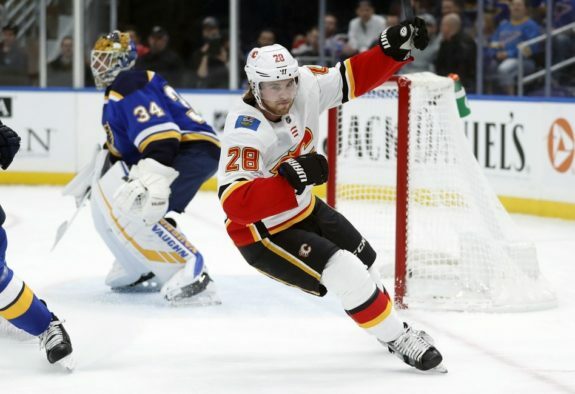 The sample size is small – and the Flames had two extra-time losses and nine wins during this stretch as well – but these losses show a recipe which opponents can exploit. Similarly, it showcases the need for alternative scoring when their biggest stars are struggling. That’s a big if. If yes, it will certainly boost their depth. Right now, the if is trending toward no. Head coach Bill Peters is certainly trying to get his big signing going. In the shutout loss against the Tampa Bay Lightning, Peters even gave Neal the chance to win the game as the third skater to go for the Flames in the shootout. All he needed to do was score, and he did not. The shootout went on for another four rounds and the Flames ended up on the losing end. At times, Neal has looked more involved. He had a stretch of being effective in December, but that did not translate into points. And when a puck bouncing in front of him leads to a potential late game-winning goal by Dan Girardi – quickly answered by Gaudreau – it sparks the ire of the Flames fanbase, haunted by failed free agent signings of the recent past, most notably the Troy Brouwer experiment in the last couple of seasons. 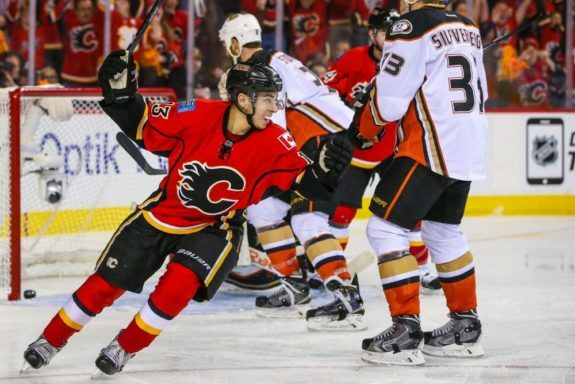 The Flames’ top four forwards, Gaudreau, Tkachuk , Monahan and Lindholm, have 48, 42, 40 and 39 points, respectively. Their next forward on the scoring chart is Mikael Backlund, with 18. He’s behind the team’s captain, defenseman and possibly Norris Trophy contender Mark Giordano, who has 35 points. A lot has been said about how the current Flames squad looks positively better than the ones from previous years, and the team is performing at a sustainable level. Calgary is among the NHL’s best possession teams, ranking sixth in the league on five-on-five with 53.34 Corsi for percentage as we approach the midway point of the season. For instance, in the loss against Dallas, the Flames were a 35.6 percent possession team after 40 minutes. Despite a third period push, high scoring chances finished 13-5 in favor of the Stars. On Saturday against St. Louis, the Flames were victims of uninspiring goaltending by Mike Smith, but the team did not have a great outing either, looking flat in the first and third periods. Indicators show that Calgary is likely to continue its strong season, but the recent slide has also made areas of concern more noticeable. In a span of six days, the Flames played St. Louis twice. The first meeting, on Dec. 16, saw the Flames win by 7-2. Gaudreau, Lindholm and Tkachuk had multiple points each. Six days later, the Blues adjusted and defeated Calgary 3-1. If a team in the bottom of Western Conference can adjust like the Blues did, limiting the Flames firepower for a game, then Calgary has some adjustments to make moving forward. Christmas break came at the right time. Maybe it’s just what the team needs to get back on track.